Obituary – Dent, Ira Hoke « Perry High School Alumni Association, Inc.
Ira Hoke Dent, resident of Perry, died Friday, December 19, 2003, at the Perry Memorial Hospital. He was 55. Funeral services will be held Monday, December 22, 2003, at the Otoe-Missouria Cultural Center in Red Rock. Interment will be at the Otoe-Missouria Cemetery under the direction of Poteet Funeral Home in Pawnee. Ira Hoke Dent was born December 2, 1948, in Perry to Abraham Dent Sr. and Wilma Dailey Dent. 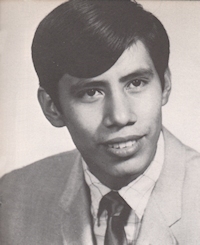 He attended Northern Oklahoma College and served in the United States Navy from Januay 2, 1970, until his honorable discharge on December 3, 1975. He worked at Tinker Air Force and as a driller in the oil fields and for the Otoe Tribal Police. He was a member of the Church of Jesus Christ of Latter Day Saints. Survivors include two daughters, Lori Lee Dent of Texas and Keeley Renae Dent of Morris; six sisters, Patricia Black of Red Rock, Rose Lane of Perry, Carol Aguero of Perry, Madge Artman of Newkirk, Rhoda Dent of Stillwater and Edye Habibi of Enid; three brothers, Joe Dent of Red Rock, Abraham Dent Jr. of Stillwater and Danny “Dana” Dent of Vinita; and a number of nieces, nephews and other relatives.